Jennifer's 365 Project: 285/365 - Hackintosh Success! ....kinda... Not everything is working 100% right, but almost. I can't seem to get the wi-fi working properly. At first, I thought I missed a kext when installing it, but I noticed that OS X 10.5 recognized the adapter... Now I just think its a question of configuring it right and well..I've used PC's for so long not everything is obvious. Everything says to use AirPort to configure, but I know with the Hackintosh you don't do that. Admittedly, I've not spent a tremendous amount of time poking around - I'm slightly obsessed with Dragon Age: Origins. The install was easy. Chris gave me an external USB DVD-Rom for X-mas, so I simply booted up the iDeneb ISO I had and voila. 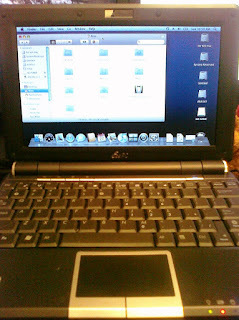 Of course, I did buy a Snow Leopard DVD and want to run that as opposed to Leopard, so I will need to do some tweaking in OS X to get a bootable USB drive working that works with the Asus hardware. Outside of getting this awesome breakthrough (in a project that has taken me ages trying to do it without a mac, and without a USB DVD-Rom), I played a little Dragon Age and made some tasty sugar cookies. Complete with frosting!